What? Azimech builds a jet fighter? Gone insane? Nope, I already was. What you see on KerbalX every week is a pattern. Fighter Jets. Some are original designs but often you see yet another A-10 Warthog, F16 Fighting Falcon etc etc. Gazillions of fighter jets are uploaded and often without ever looking if the type already exists and why it would ever stand out from the others (in the case of the A-10, just use the search, if that doesn’t give you the BRRRRT, I don’t know what will). I would never touch the freedom users have to upload whatever they like. But with almost 20k designs on this website, you gotta do something extra to stand out of the crowd. So I’ve chosen to build a fighter this time to have the opportunity to write that little thing above. You can do with it as you please. Judge it, take note, whatever floats your boat and don’t worry, I don’t care. Okay, about this plane. It’s a multi-role. With tanks full (3200 units) it’s a fast interceptor and can supercruise at Mach 2+ at most altitudes. With tanks filled at 1/3 it becomes a dogfighter. While not supermaneuverable, it’s decent enough for such a heavy crate. It also becomes a STOL. Look at the last picture in the album. The acceleration can be violent! Max TWR with tanks full: 3.1. Max TWR with 100 units of fuel remaining: 7.7! Flight control is excellent. Most of the time you don’t need SAS. Actually you never will. It never stalls (until proven otherwise by some excellent pilot). The only reaction wheel on this plane is disabled. This is pure flying! Fast & lazy control sequence for taking off: Press 3,4,5,Z,1,2. You don’t even need to switch on SAS or touch the controls. Yes it will drive off the runway, no it doesn’t matter. Landing: switch off roll on the rear outboard elevons to make the controls less twitchy. The rest: just try how crazy you can be with this one. The one thing I know for sure is it can’t land inverted. Fun experiment: with dry tanks and at 3000m altitude, at any pitch or roll angle, just toggle the flaps and lower the landing gear. Also switch off SAS. If the terrain is flat enough, it will land itself without control input. There’s enough room for hardpoints for the BDA lovers. This thing can do anything: CAP, bombing, intercept and air superiority. With 200 units of fuel it can reach space in less than 3 minutes! Take off, fly level at 2000m. until you reach max speed. Switch of SAS and don’t touch the controls. Max altitude measured: 82km. Flying at Mach 2.2 it has a range of 29.000 km! Max roll rate: 1260 deg/s! Need a quick loss of speed? 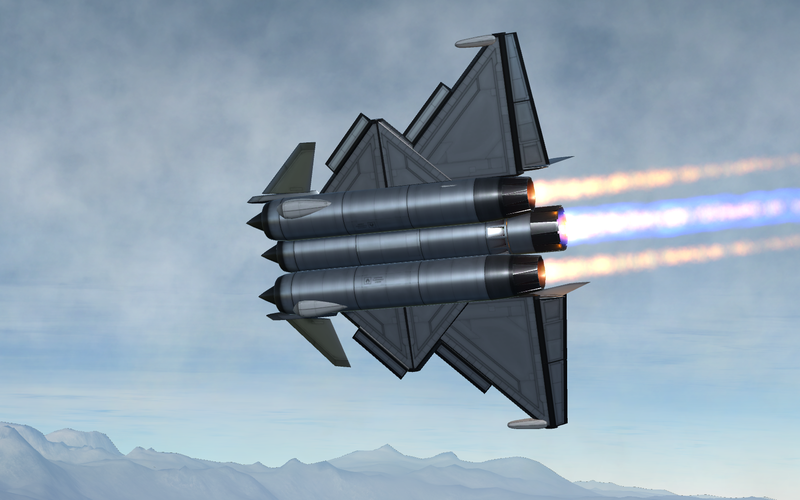 Fly at Mach 3.5+ at low altitude and tanks almost empty. Pull hard on the stick and presto. Max measured G’s: 134.1! Replaced the middle engine with a Whiplash. Top speed increased from Mach 3.0 to Mach 4.8. Tweaked the wheel friction settings to match KSP 1.4.x values. Built in the SPH in KSP version 1.4.3.